Researchers in the Maine Agricultural and Forest Experiment Station and their colleagues from neighboring institutions published a report called "Bees and Their Habitats in Four New England States" this summer. The report includes previously unpublished information and a synthesis of literature relevant to Massachusetts, Maine, New Hampshire and Vermont. 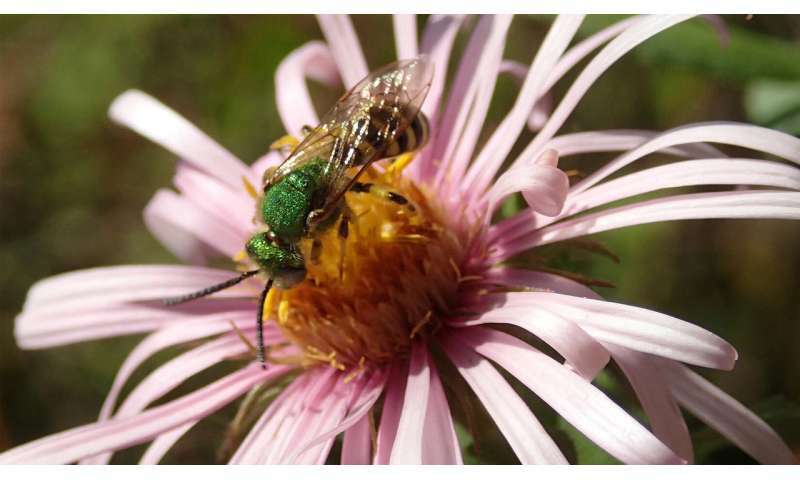 The report also offers recommendations for bee habitat improvement, summarizes new information about the economics of pollinator habitat improvements, and identifies knowledge gaps to help prioritize future research directions. Over 400 species of bees have been documented in these four states. Most are native to the region, but little is known about the ecology, life history, population dynamics and host plant relations for most species. Bees face threats from habitat loss, pests and pathogens, pesticides and climate change, and some species are in documented decline. Due to the difficulty of quantifying bee populations, the authors focused on their habitats, because people can manipulate features such as flowers for bee forage and pesticide use. The publication lists 15 bee habitats with natural and anthropogenic features, and suggests 40 plant taxa that may be effective in plantings for bees. Potential habitat improvements noted in the publication include planting suitable flowers and mowing less intensively to improve food availability, and minimizing pesticide use. The publication's recommendations, if adopted, could help bee conservation and pollination security, and aid in protecting pollination of native flora and crops like lowbush blueberries, cranberries, squashes and apples.